Most people experience pain in their knees at some point in their lives. For some, knee pain can be so severe that it may limit their daily activities. For others, mild knee pain may be a chronic reminder that they cannot have the active lifestyle they desire. There are many reasons for knee pain, and whether it is because of a sport injury or arthritis, chances are you would like a treatment that will help ease the pain. Today, I would like to share some valuable information about how you can help relieve pain due to arthritis in the knee. Personally, I have few members of my friends and family who suffer from arthritis in the knees, so I can see how it affects their lives on a daily basis. Arthritis is a common cause of severe knee pain and disability. The three most common types of arthritis found in the knee are rheumatoid arthritis, post-traumatic arthritis, and osteoarthritis. In all three of these types of arthritis, you can experience stiffness and swelling, chronic pain, and difficulty bending your knee. As you all know by now, I believe in the powerful healing properties of food. So, I am thrilled to share with you some new research that suggests that sesame seeds, when taken with an over-the-counter pain reliever, are more effective at treating knee pain from arthritis than medication alone. Researchers at Tabriz University of Medical Sciences in Iran divided 50 people with arthritic knee pain into two groups. One received 2,000 mg of acetaminophen and 500 mg of glucosamine daily. The other group got 2,000 mg of acetaminophen plus 40 grams of ground sesame seed daily. After two months, the group that received the acetaminophen plus sesame seeds reported less pain as well as increased mobility and function compared to the group that took acetaminophen and glucosamine only. 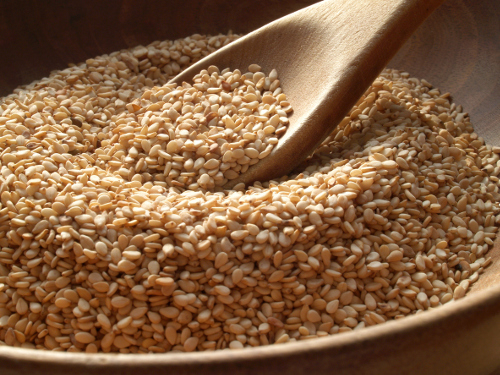 So, why do sesame seeds work to help ease symptoms of arthritis? There is an ingredient in sesame seeds called sesamin, which is a lignin, a group of chemical compounds found in plants. According to studies, sesamin may prevent inflammatory activity of insulin, which would ease pain and decrease swelling and stiffness. Another study also suggests that sesamin could be a possible therapeutic approach for the treatment of arthritis because of its beneficial effect on building cartilage thickness. Sesame seeds are also high in zinc, a mineral that boosts your immune system and has a positive effect on bone mineral density, which can help ease bone pain in the knee. Sesamin also has other potential benefits, including promoting weight loss, reducing LDL “bad” cholesterol, and even inhibiting proliferation of cancerous tumor cells. So, with all these benefits, why wouldn’t you give these tiny seeds a try? They are crunchy and delicious sprinkled on salads, blended into smoothies, or just to eat off a spoon! The recommended amount that was tested in the study equals out to approximately four tablespoons. Although there are no known side effects to taking sesame seeds, you will want to stay away from this knee pain treatment if you have an allergy to sesame seeds. So, if you suffer from knee pain caused by arthritis, next time you reach for your painkillers, try following them up with a few tablespoons of sesame seeds! https://www.peoplespharmacy.com/2014/02/10/sesame-seeds-work-better-than-tylenol-to-ease-knee-pain/, last accessed May 11, 2017.
http://www.healthline.com/health-slideshow/causes-of-severe-knee-pain-leading-to-knee-replacement#4, last accessed May 11, 2017. “How To Use Sesame Seeds For Knee Osteoarthritis,” Healthy and Natural Life, February 24, 2015; http://www.healthyandnaturallife.com/how-to-use-sesame-seeds-for-knee-osteoarthritis/, last accessed May 11, 2017.